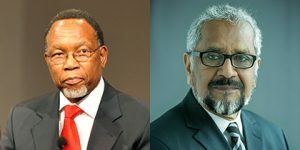 The Global Commission on Drug Policy is honored and delighted to welcome as distinguished new members, Kgalema Motlanthe, former President of South Africa (2008-2009), and Cassam Uteem, former President of Mauritius (1992-2002). Kgalema Motlanthe was politically active from an early age, serving in the ANC (African National Congress) and imprisoned for ten years on Robben Island under Apartheid. Upon his release in 1987, he organized the mine workers, strengthened the unions, and participated in re-establishing the ANC structures in 1990. He then served two terms as Secretary-General of the ANC (1997-2007) before becoming President of South Africa and then Deputy President until 2014. Cassam Uteem trained as a social worker and participated in Mauritius’ struggle for independence. Over 30 years ago, as a Counsellor of the City of Port Louis, he worked to introduce the first drug rehabilitation services in the country. Mauritius has since pioneered drug treatment and harm reduction services in Africa. Mr. Uteem went on to become the longest serving President of Mauritius. For more information on Kgalema Motlanthe, please click here. For more information on Cassam Uteem, please click here.